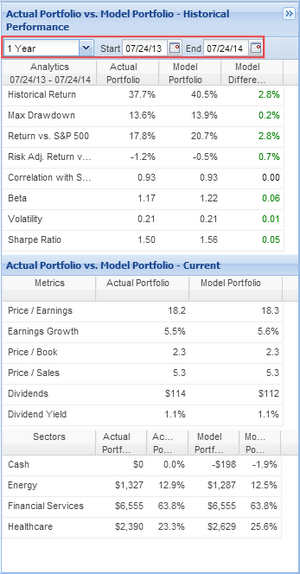 The Portfolio Trade Planning facility (Premium; previously called Portfolio Modeling) allows you to test potential trades, which creates an alternative version or model of your portfolio. 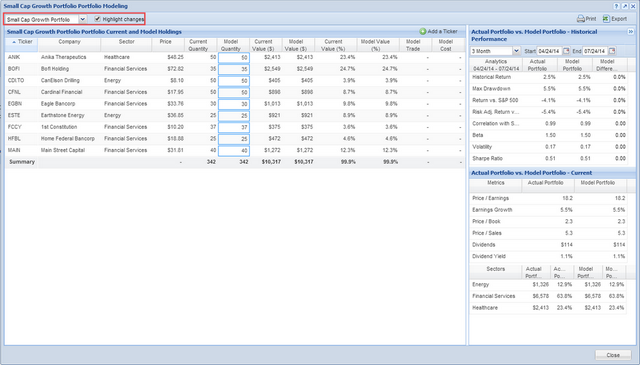 You can then compare the model portfolio against your actual portfolio in a number of key data points. The goal is to assist you in making intelligent changes to your portfolios to achieve your investment objectives by demonstrating how potential trades affect the portfolio across many different factors. 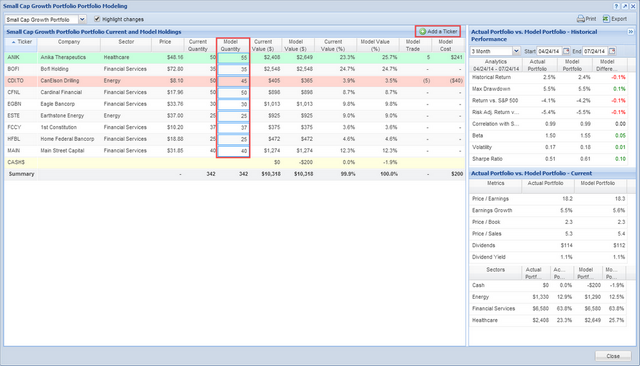 To plan trades, right-click it in the Navigation panel and select ‘Plan Trades’ from the drop-down menu. 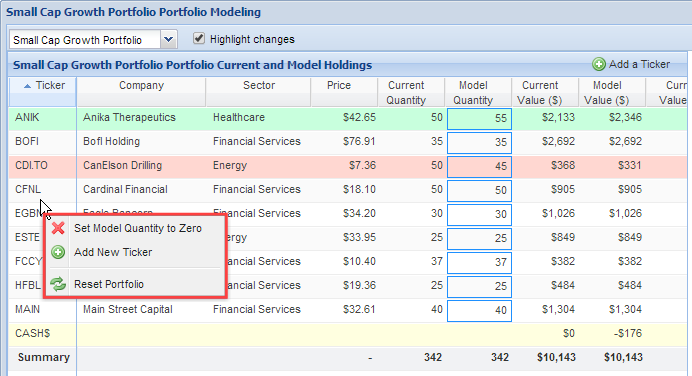 To begin to model your portfolio, type a model quantity into the cells outlined in blue. If you have ‘Highlight changes’ checked, an increase in shares will cause the row to turn green, and an decrease in shares will cause the row to turn red. To add a ticker to the model portfolio, click ‘Add Ticker’ in the top right and you will be able to search for a ticker to add in the new row that appears. The ‘Model Quantity’ starts with the same value as the ‘Current Quantity’ value. When you change the quantity, the ‘Model Value’ column will update with the Model Quantity multiplied by the price (which is the current price.) The Percent of Total Value for the model will update accordingly, and you can see the model trade and model cost in the last two columns. 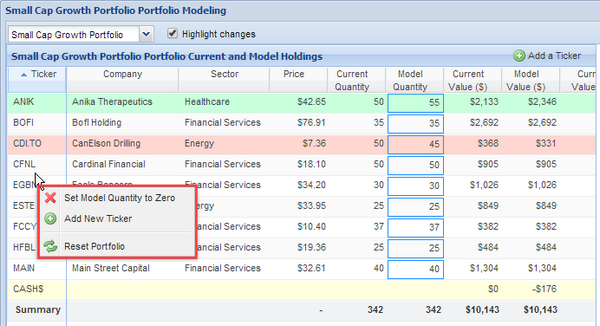 To remove a ticker, or reset the model portfolio to the original, right-click a row and select from the drop-down menu. 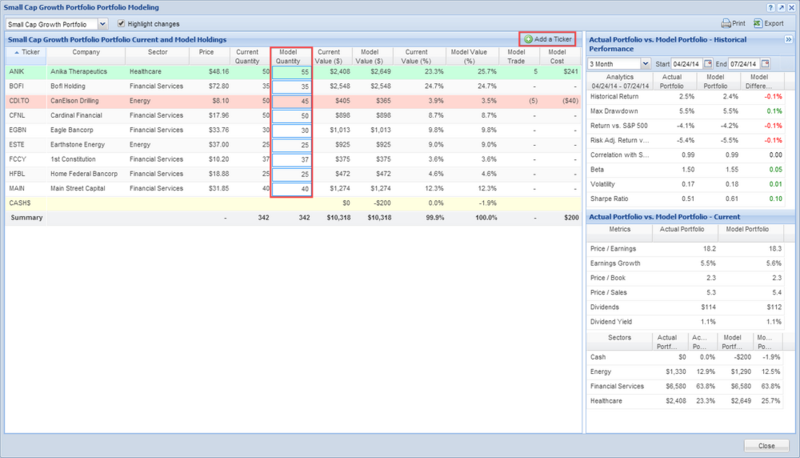 As you make changes to the portfolio on the left, the right-side panel of the window will update as you change the model quantities to show comparisons between your actual portfolio and your model portfolio. The first section shows analytics calculated over the selected time period. Historical Return shows what your return would’ve been if you’d made the model at the beginning of the selected time period. The next set of metrics use data from the selected time period to calculate risk in various ways, and compare that to those same metrics had the trades been executed at the beginning of the time period. The second section shows some portfolio stats for the current portfolio and the model portfolio, and the third section shows the cash position, as well as sector breakdown for the actual portfolio and the model portfolio.